"Set in a city of scientifically advanced superhuman students, but in a world where magic is also real. Toma Kamijoâ€™s right hand, the Imagine Breaker, will negate all magic, psychic, or divine powers, but not his own bad luck. One day he finds a young girl hanging on his balcony railing. She turns out to be a nun from the Church of England, and her mind has been implanted with the Index-Librorum-Prohibitorum - all the magical texts the Church has removed from circulation." No other information is available at the moment. Possibly more when the actual novel begins selling in stores on June 10th. First things that sprung into my mind were Chrono Crusade, Night Wizard, and Da Capo. I've never read this light novel, but probably will start now that it has piqued my interest. Although no mentioning of demons or any sort of action, the fact that it mentions a religious church with magic is a rather interesting mix. The other twist is the involvement of a high school boy, which sparked Da Capo in my head. I get the feeling that this may be a mix of high school romance/school-life with some nice action. I'm still into magic stuff, so this should keep me entertained when it comes out. By the way, ANN has no info on this novel so I have almost no clue and apologize if this personal opinion throws anyone off at all. I am looking forward to the subs for this one. I have to agree that it does look very promising. I just finished the first episode, and must say it wasn't at all what i was expecting, though I don't think that is such a bad thing. the first episode of this series really reminded me of tokyo underground. I have to say that I was impressed by the first episode. The animation and character design are top notch and I also like that there seems to be a lot of comedy involved. I'm picking up this series since it's showing prospect we'll see how it plays out, hoping it's not another Nabari no Ou which seemed good but turned out to be boring. Hmmmm, This series did a good job in the character department as well as story. The only bed thing I can ya about the main character is that he has generic hair. Other than that I hope this series improves and gets better (it is great to begin with), this could get really big. I Gurren My Lagann, Do You? the fact that mami kawada is singing the OP is a good enough reason for me to watch this series! "Pitiful shadow cloaked in darkness. Thy actions cause men pain and suffering. Thy hollow soul drowns in thy sins. How would you like to see what death is like?" I love eating plastic sandwiches too! Aside from that, does anyone know how long this series will be? It looks like it could span more than 26 episode (there are sixteen light novels...) but it seems like a good series and if it turns out to be as good as the first episode showed it to be, I just hope it doesn't turn out to be full of fillers . I watched the first episode last night and this is abolutely incredible...this Fall Season is one of the best in recent times with such an influx of just amazing anime being premiered. The OP is incredible and the main reason is because its sung by Mami Kawada. The ED is great too. This is incredible work by J.C. Staff (my company...lol ) and I saw GAINAX's logo in the ending credits to the first episode, so I'm guessing they're helping J.C. Staff somehow in the production of this series. WOW....so there's 16 volumes to the light novels and only 10 chapters (of Volume) to the manga which have been scanlated and the manga also has a side story called "To Aru Kagaku no Choudenjibou". It gave me a Shakugan no Shana vibe, which is an extremely good thing. This could possibly be one of the top show this season. The back and forth between Index and Kamijo was entertaining and it was hilarious when he just gave her everything that had spoiled in his fridge in a single bowl and she was just gulping it down. The vive is most likely because of the opening song, I didnt check but i wouldnt be surprised if it was the same artist, the sound and the voice sound way too similar. So after finally getting around the sub...I find Index even more moe than before...and this is probably the best series this season thus far aside from Gundam 00 2nd Season and Tales of the Abyss, both of which I have yet to watch subbed. Nevertheless, I have never read the manga/novel so I have no idea of this story, but it's rather interesting....though I did shout Train Heartnet as soon as Rail Gun was mentioned Interesting concept though and I look forward to more development. Animation is definetely top notch though and the ending theme really grew on to me this time after hearing it a second time. I liked the first episode of this series. Will give it a couple more episodes before deciding whether to watch or drop. Location:Kami, Hyougo, Japan in the summer and Moriguchi, Osaka, Japan in the winter. Interests:I'm trying to find some new unlicensed anime to add to my collection. I love anime and manga and can't get enough of it, plus I'm flexible, and will watch almost anything.<br><br>Promoted to the Sempai level on January 31, 2007. Wow, all I can say is that this is a MUST SEE of not only this season, but of the entire year. Definitely getting some Shana vibes from this series, what with the Maki Kawada OP, JC Staff animators, or the fact that the light novels are also published by ASCII Media Works under Dengeki Bunko, all I can say is, why did it take them so damn long to make an anime of this? The first episode was amazing, and really drew me in quickly with the esper stuff. 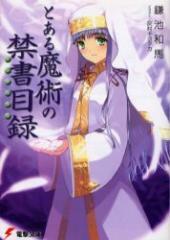 And then Index (so moe~) was introduced, and I already love her character, the imaginative setting, and set-up. Truthfully, I did not expect it to turn out like this, as I didn't look into the theme songs or animation studio; all I knew is that it was a popular Dengeki Bunko light novel series (and since Dengeki Bunko-adapted anime tend to be really good) I knew I had to watch it. I think it's definitely going to be 24/26 episodes, and perhaps we can hope for a second season in a couple years like they did with Shana. Key's newest game is called Rewrite. Click image to go to the Key thread. - Kanon, Air, Clannad, Little Busters! I finally got around to seeing this, and I have to agree with everyone's opinions here, that it's going to be stellar! I love the two protagonists and I think that they have great chemistry which is important to make it work. I also really like the setting and the music... well I've never seen Shagukan no Shana so I can't really compare it but generally I think JC Staff does a really good job on their projects so I'm very interested to see how it turns out.